changing date on scanner in order to backtest — s.c.a.n. Is it possible to change the end date on the scanner? 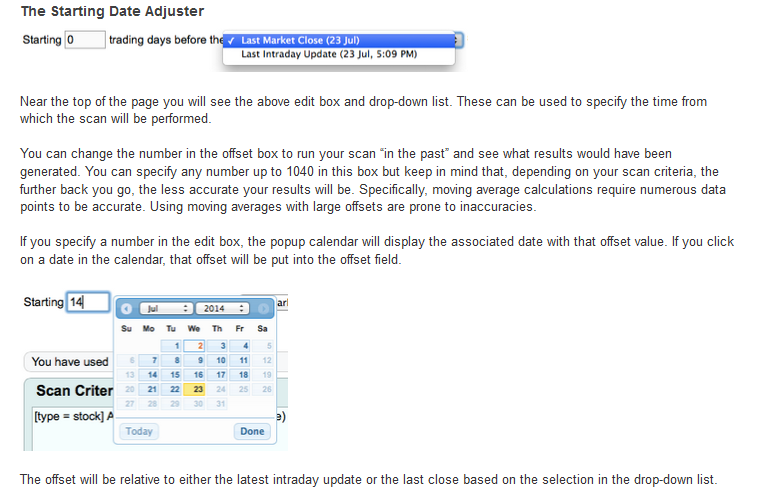 Yes, see the scan documentation, here's the section on how to change to a date in the past when a scan runs. Unfortunately you can not run a scan today for some date in the future. Yes. On the Advanced Scan page You can use the drop down calendar above the Scan Criteria window (where it says "Starting 0 days before...") to run your scan for prior days. Click on the "0" window to get the calendar. But note: when you look at the charts for the symbols returned by the scan, the charts are dated as of today - NOT the date of the scan. That's probably fine if you ran the scan for a recent date. But if you are researching something back a couple of years, you will want to change the chart's start and end dates. You can change them by clicking on any chart in the list, so that you go to the Chart Workbench. There, under Chart Attributes, click on the "Range" window drop down and click on "Select Start/End Dates". Choose the dates you want, apply them to the current chart. Then to apply them to all the charts in the list, slide down to the bottom of the page and click "Apply Style to All".